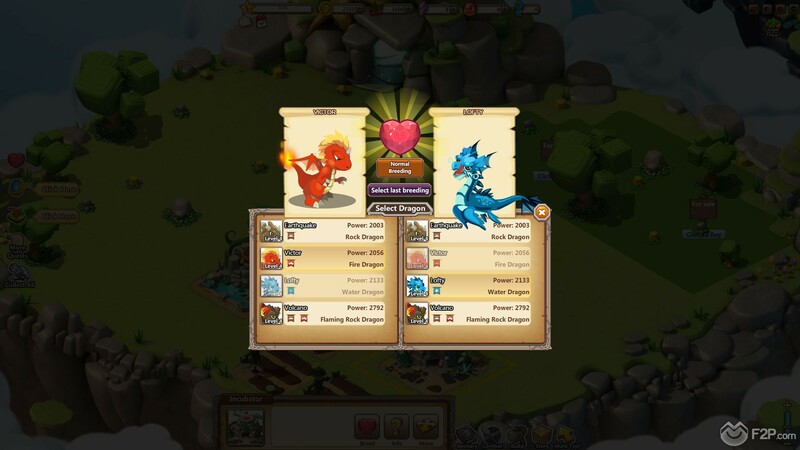 Recently we took out some time to check R2Games’ new Facebook only MMO Kinderdragons, a free to play title where we got to run our own floating island and were tasked with the job of breeding a variety of dragon pets and forcing them to fight for our gain against other player’s dragon teams. 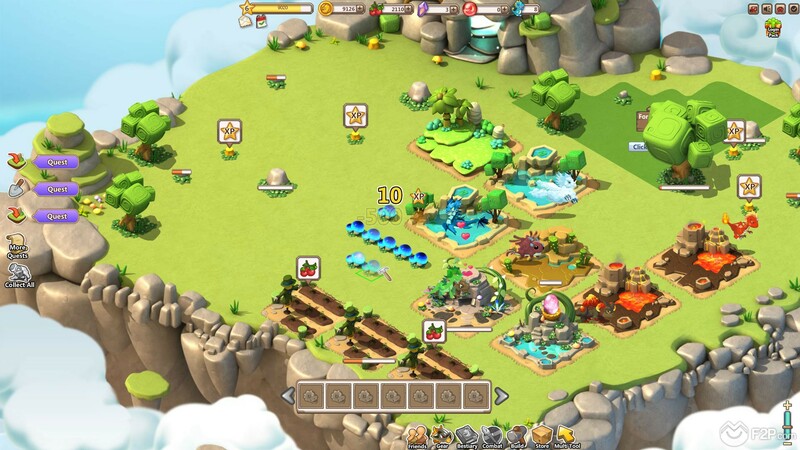 The game was very much a Farmville meets Pokémon style title, albeit the building/farming side of the game was a bit on the thin side; with our newly registered account we gave the game a few hours to see what it was about. 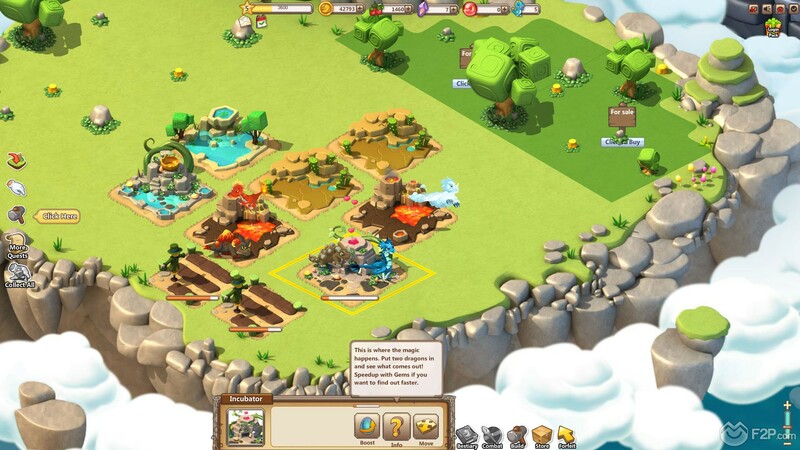 Starting from scratch we had a blank plot of land where we could construct various buildings, similar to games such as Farmville, Farmerama or other base building MMOs, we had a finite amount of land and each building took up a set amount of space. These buildings would provide everything we need to create dragons, from Incubators where we could light some candles, play some Phil Collins to set the mood and let our dragons bow-chica-wow-wow and create a dragon egg, which we’d then grow and hatch in a Hatchery. 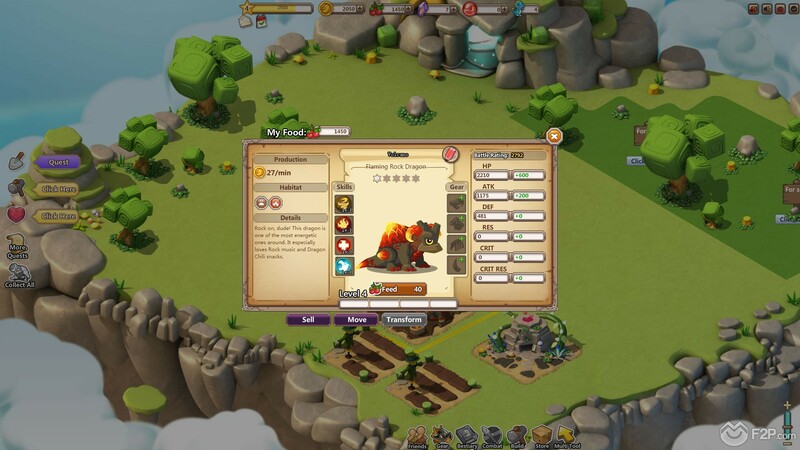 New dragon arrivals had to be put in a nest and then we’d feed them with food grown on our farm; whilst the game is vaguely like other farming games it does lack the depth; no real symbiotic-recycling of resources to make a self-sustained farm other than dragons in nests produced gold to be spent elsewhere. There were a severely limited number of building types to construct and so even though you could expand your lands and even purchase new islands, the only need for this would be to have a ton of nests to hold more dragons. 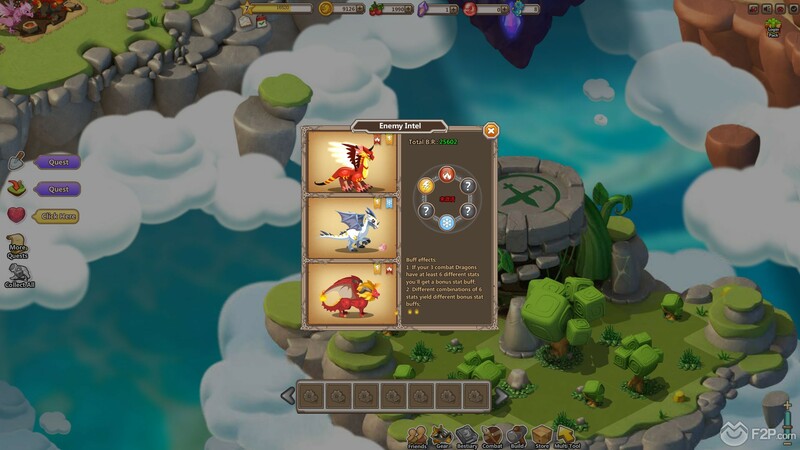 Where the game lacked buildings it did have dragons in abundance, one of the core concepts of the game was to create our own dragons by breeding different types together; with the main four that you can purchase from the shop with gold (all others requiring premiums currency) you could have Fire, Water, Rock and Plant; combining Fire and Water would give a Cloud Dragon, combining Fire and Rock would create a Fiery Rock Dragon, which retain the “dragon type” of both parents. It was an interesting element and the “Gotta Catch ‘Em All” element was strong, the only thing we didn’t like is that you could see all the different types of dragon available either from the egg shop or the premium purchases, so unfortunately it completely removes the element of surprise and excitement of what different dragon combinations might create, which we feel would be a really fun element to the game. With a few dragons under our belt that we’d managed to breed, and level up through feeding, we’d accumulated enough XP to unlock the first PVP mode, Tournament, which prompted us to build a team of three dragons. 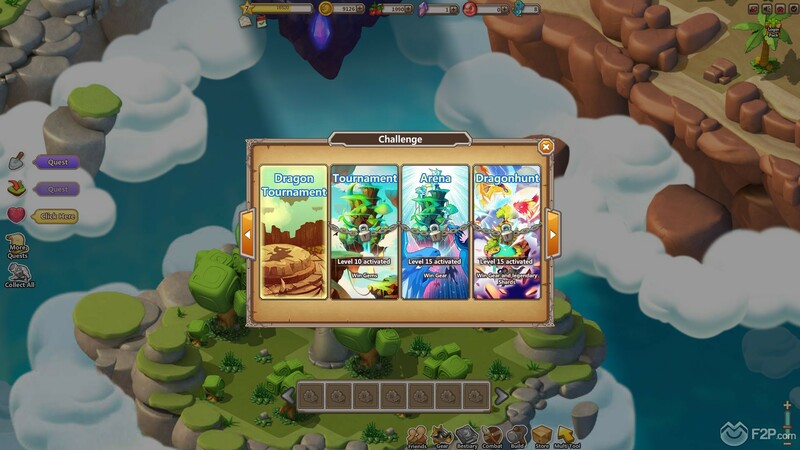 The strategy players use at this stage isn’t that important, but it will no doubt require some thought later game; the game encourages you to try and cover six different dragon types (water, fire, plant, electro, sacred, etc.) which would give you a combat boost, but we only had access to the basic four to start with. 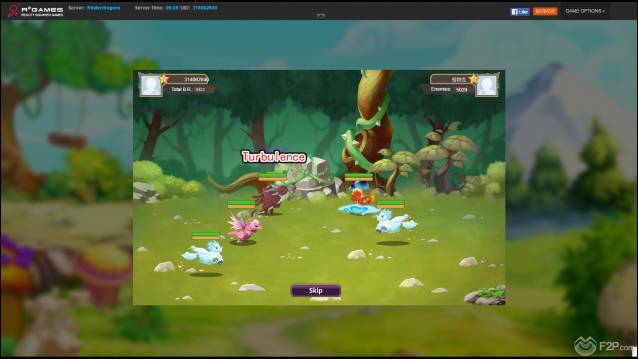 The combat itself was fairly underwhelming as it was completely automated; our dragons all fought until one team was wiped out; levelling up dragons gives the higher stats and new skills, but players have no control over what is used as far as we could tell (way shy of Pokémon). Whilst the combat wasn’t particularly interesting, the most frustrating thing was that after we came out of our battle and tried to have another fight where we were informed we had a cooldown on the event of 12 hours before we could attempt it again. How this stacks against the other PVP Modes we’re not sure, and it may be because the reward was 2 Premium Gems, but the reality is that it was the first PVP mode unlocked and we couldn’t really play it. Getting locked out of the game started to become an issue across the board, whilst early game we had a lot of premium Gems to rush construction/breeding/hatching as we picked them up when we levelled up (which is pretty quick the first few levels), by around level 8 we were out of Gems and had no easy way to get access to them. This is fine in itself, we don’t expect games to throw premium currency at players, but breeding AND THEN hatching an egg both took three hours EACH, so completing quests that revolved around this was impossible for any persistent gameplay. Constructing buildings, clearing land, growing crops, all took 30 minutes or more and so we ended up being sat there with literally nothing to do other than exit the game… this, to us, doesn’t scream good game design. Whilst on the one hand if players desperately want to keep playing they have the option of purchasing Premium Gems, the fact is that there are so few features to the game outside of grinding out dragons (which are extremely basic to make); there is nothing that grabs you and makes you go “I just want one more turn!”, it needs stuff for free to play users to actually do. Overall whilst the game does look pretty decent, with the type of colourful and cute graphics we’d expect of a Facebook only title; the concept has potential but the execution leaves much to be desired and ultimately lacked enough content to keep us entertained. Strategically placed content walls with level locks and build cooldown timers blocks off the already small amount of content available and makes the game feel more like a pay-to-play in order to keep going.